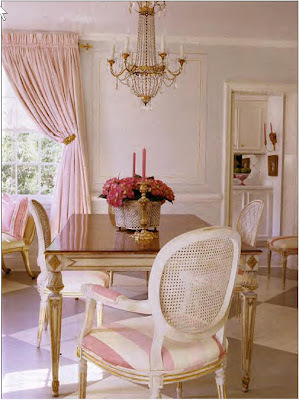 Dining Room with pink striped french chairs, pink striped draperies, and pink pillows. If this room looks vaguely familiar to you, it's no wonder why. First published in Traditional Homes in 2003, this house has been in print each year since in one magazine or another. I'll admit that I was intrigued with this house when I first saw it. The owner hired Suellen Gregory to design the entire place in pink. And as it was explained in detail, the pink is not just any pink, but a very specific blue pink that she had grown up with, as her mother, apparently, loved this shade of pink, too. I had never before (save for Martha Stewart's pink guest house) seen a house decorated all in pink, but it was pretty and obviously other people thought so too, because it has been the most published house ever, probably. 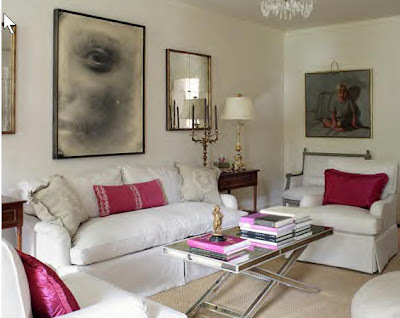 So, yesterday, after reading about the pink house for the umpteenth time, this time in Decor, 2007, I decided to check out Gregory's web site and take a look at her portfolio. Lo and behold, imagine my surprise to find that the pink house is no more. Today it is white, completely redone by Gregory, with the pink totally banished except for small accents here and there. Funny, but the white version of this over-publicized house has never been shown in print. I wonder why? 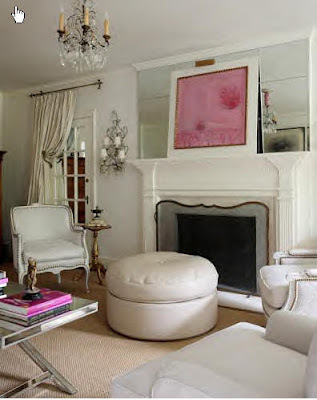 Living Room with pink pouf, pink French chairs, pink chintz slipper chair. 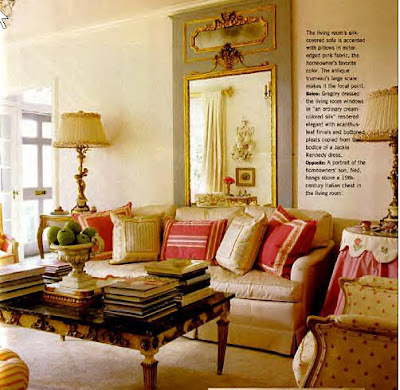 Another picture of living room with pink pillows, pink skirted table, pink french chairs. Living room today: white fabrics, new chairs, new mirrored glam table. More glam details: newly mirrored mantel, newly painted french chairs, newly upholstered pouf, new fireplace screen, new curtains, but the same sconces. Dining Room: new chairs, new Niermann Weeks console, floors still checkered but with more dramatic colors, same table with but newly mirrored top. Which do you like better, the white house or the pink house? That's a tough one! Both are stunning! The pink seems a bit more homey and not so stark (more my style). But there is no denying that the white is very glamorous!! 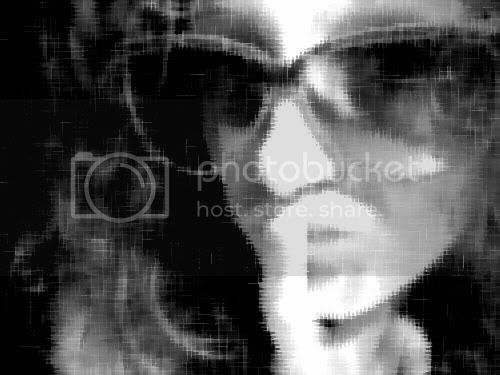 Thanks for the wonderful photo's! As much as I love the white look, for that kind of pretty traditional look, the pink is just perfect. It's like the difference between a pink confection of a dress and a plain white one. The pink is just so sweet and pretty. Nierman Weeks rocks! I've been following them for years and they just get better and better. Thanks for all the comments! I love posting late at night and waking up to so many comments and such thoughtful ones! To me, it was just kinda funny because, like I said, everytime I open a compilation type magazine, there the house is again. But in reality, it no longer exists and she's moved on. The pictures of the pink house don't come off as pretty on here as in the magazine. It was really beautiful. iow, I just don't know which I like better. The new dining room is gorgeous, but I loved the old one too. I like the pink house more...it seems to have more warmth and heart to it. 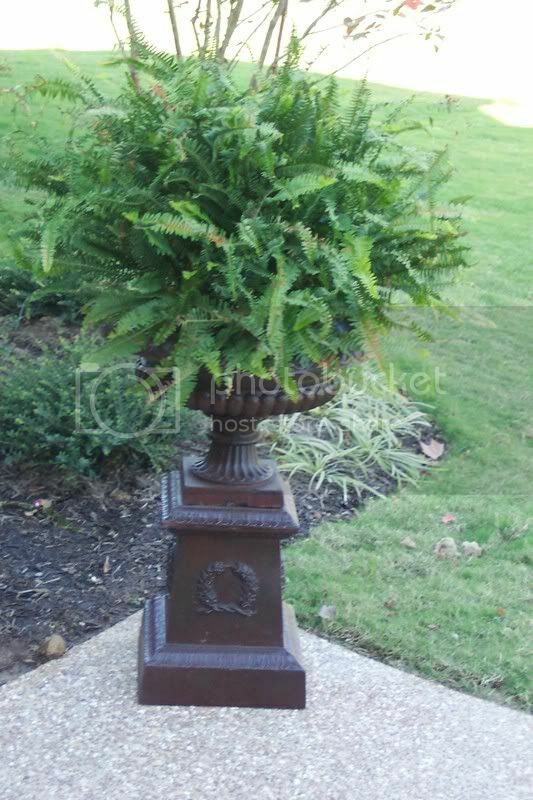 However, I love some of the furnishings in the new white house. I wonder if the same people live there, or if they simply redecorate every few years? Perhaps they got tired of living in a pink house. I have to say that I'm loving them both...it's hard cause I love white and I love pink...so you see my predicament :) Great post Joni! It's difficult to decide which I like best, since there are elements of each, I like. It is funny, they've used this home often in different publications. I wonder if that happens with other homes. I have to say I looked very fast at all the pictures to see which just really hit me. I have to say the pink version was the one that felt like a place I would like to spend time in. To me the white was very nice but too stiff and cold for me to handle everyday. Pat, yes, it's been used to death. That's what's funny about it, it's not even here anymore and they keep printing the same old pictures! 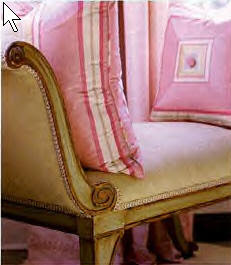 Sarah: yes, it's the same people because there's the same furniture, plus a little pink too! GMG, haha - I can't pick either! Maybe the white, but === I do like the pink! I'm not really loving the white so much. I like the pink much better. I like them both and think that it is great that things can be changed around from time to time. The only thing I wonder about is the issue of our consumerism and the recycling of products. As a Designer I am starting to become very aware of throwing everything out into landfills when we become tired of them. I do like the idea of some permancy in our homes. Things become valued treasures as the years pass. Anyways not to take away from your beautiful post and your keen powers of observation. The Nierman Weeks console is fantastic. I love all their product and what an interesting and thought provoking post you have done!! Patricia, so sweet - as usual, but also so thought provoking, as usual. You always add an element of intellectualism to everything you post. Interior design has become so trendy due to places like Pottery Barn, RH, and Crate and Barrel where the "in" colors change 4 times a year and everything is affordable. It used to be you would get your house "decorated" and if you were lucky maybe in 15 years you would recover everything. A sofa lasted a lifetime and it took a lifetime to pay for it. Things have definitely changed in our industry. Hi I vote for the pink one but that's because I was browsing the internet for romantic looking homes. The Pink one seems more romantic to me and I am in a romantic frame of mind at the moment. I am finishing up a book for Gibbs Smith on Cozy Waterside Cottages and in the planning stage of one on Cozy Romantic Cottages. I just discovered your blog today and think it's great. Photographer Dan Mayers and I are currently looking for another cottage to include in our book so if you know of "a perfect seaside cottage" in your area, please let me know. Wow! This was such a fun post to read and drool over! Thanks for inspiration. Have a great weekend! they're all so gorgeous! great blog, glad i found you! OK - now you are freaking me out - I never check my "The Parisienne Farmhouse" blog because I have been so lazy and in my garden instead of making indoor changes - then I check it, find your comment, come to your blog...et voila...you have posted photos of one of my most favorite magazine spreads EVER!!! I can't get the pink thing out of my mind even though my house has "like" no pink. Maybe we are really twins! And the Claudia (Paris Apartment) is commenting too! Crazy! Beautiful photos! I think that I would personally live with the pink more easily. I love your new banner...you did a great job with it! 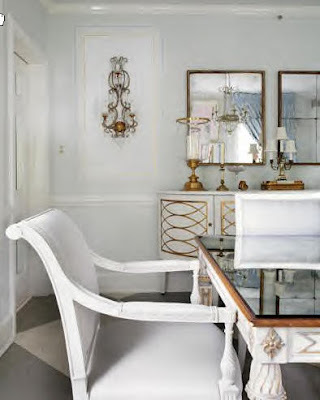 Just discovered your wonderful blog -- and there is one of my favorite rooms! 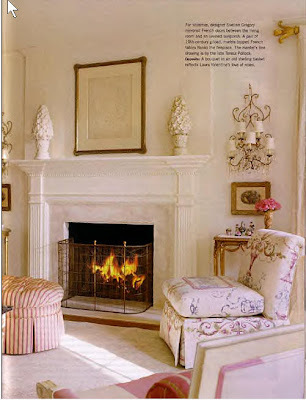 Yes -- I do vote for the pink room for its charm and sense of warmth, whimsy and joy. The white room seems too cold -- and joyless. 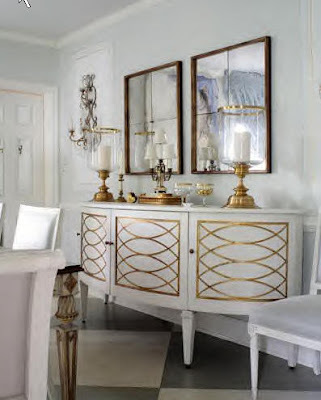 How odd to see how the large mirrors are making their way back onto to the decor scene -- so many folks pulled out those large plate mirrors -- and installed smaller ones! they're both gorgeous. obviously feminine and very personal. while the pink was a little woah for me, the white is also a little woah for me. 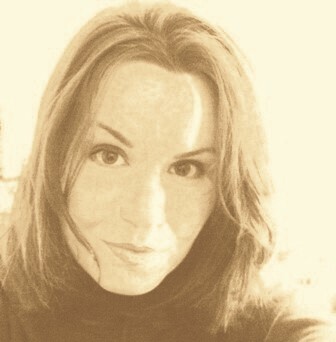 didn't really take to the gold in the white makeover... i thought some black would have been so chic. great spot on the change! I love the pink rooms! Over here in the U.K. that house has not reached us, so it was new to me and I LOVED it! Just my cup of tea! !